There’s nothing like the simplicity and awesomeness of a quick chocolate slice to bring back memories of childhood… at least in my family. Mum would often make chocolate slice for us as kids and it was of course a favourite recipe growing up. It’s little wonder that I get my chocolate love from my mum, right! Every now and again I want to flash back to that coconut and chocolate simplicity, and decide to make this choc slice recipe for the family. It takes virtually no time at all and usually lasts at least 2 days. Unless hubby gets into it, then it has little hope of lasting the day! 1. Preheat oven to 180 degrees Celsius. Line a slice tray with baking paper. 2. Mix together dry ingredients in large bowl. 3. Melt butter and beat egg together. Add to dry ingredients and mix well. 4. Press mixture firmly into slice tray and bake for approximately 25 minutes, until firm. 5. 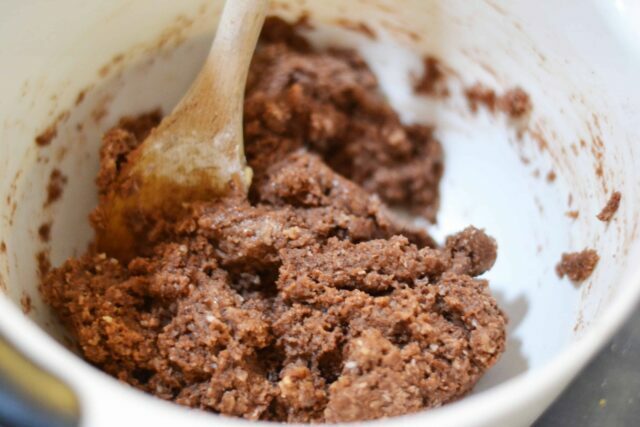 Mix icing ingredients together in a bowl to create a thick paste texture. 6. Add icing to slice while it is still slightly warm. Sprinkle coconut over the top. 7. Put in fridge to set. Cut into squares for serving. You can alternatively create a chocolate buttercream icing to add to your slice instead, however this will not set as firmly and will make it more like a cake. This easy chocolate slice recipe is one you can put together quickly if you have guests dropping by, even if it is short notice! 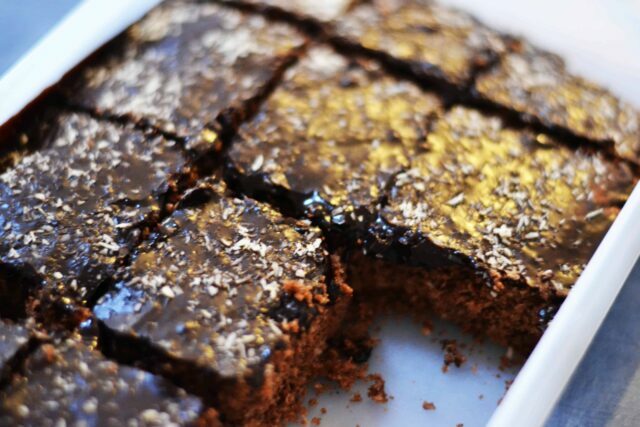 Want another quick choc slice recipe option? My no bake cherry ripe & turkish delight slice is a sweet tooth delight! Is there a favourite slice or dessert you have from your childhood that you make now? Find more dessert and sweet treat ideas on my Pinterest board devoted entirely to all things yummy and indulgent! Be sure to follow me on Pinterest for more inspiration for food, home and family! This looks delicious! I love a quick recipe, it makes it so easy to feed your family healthy food instead of opening a packet! Ooo, I love how quickly you can make this, and from stuff I would usually have int he pantry. Yum!! I love a quick and easy slice. This one looks absolutely perfect! Chocolate slice was always a quick and easy favourite in our place too. No need for packets for this one. How yummy! I make something similar and I love anything that I can bake and go. My favourite dessert is bread pudding. My nana used to make the best bread pudding and is wholly responsible for my addiction to it! Thanks for linking up to the Ultimate Rabbit Hole. Anything chocolate is a winner with my boys. Thank you. yum, just so yummy, looks great!